This entry was posted in Art, Bliss Tips, Child's perspective, Illustrations, Kids Art and tagged Coloring Book, Family, grandson, Mary A Livingston by MaryALivingston. Bookmark the permalink. I like it! By the way; I made my English vocabulary richer some time ago. I had to analyze and interpret your sentence: “Sneaking bliss on the nausayer’s watch” 🙂 I like it as well. What a great idea. I bet, when they’re older, they’ll still have them – a treasure. I give them two. 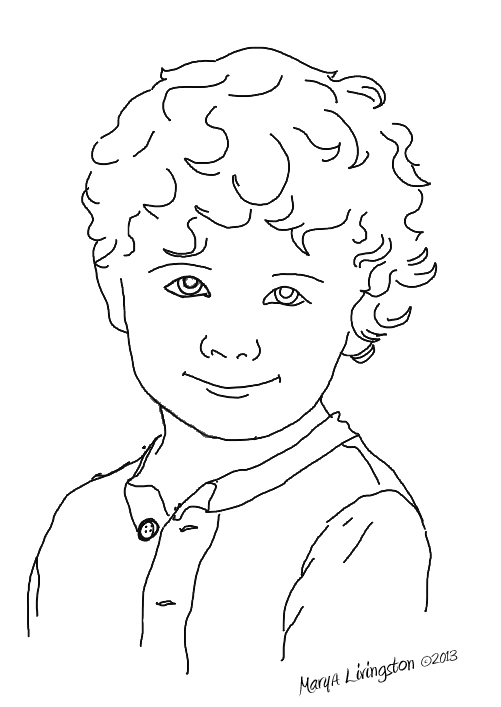 One to color, and Mom puts the other in with keepsakes. I hadn’t thought of a project like that, but at Christmas time, I had each of my grandchildren pose with a medium sized watercolor block. They held it out or up or in front of them or whatever. My thought was to superimpose something onto the white square. I haven’t done anything with it yet. Not sure what to do with it. I still like the idea. I’d forgotten about it until I saw your art for the coloring book. I LOVE this idea! I don’t have children of my own (well, a stepdaughter, but she’s heading off to college), but I do have a niece and two nephews. They live halfway across the country, so this would be a great way to “bond” even though I don’t get to see them very often. Love this idea! Now only if I could draw. Never too late to start. I am having a great time. Now if I could only reel in my schedule to be a bit more manageable – bliss it will be! Mary, this is a beautiful idea! Thank you for sharing. This is lovely Mary. I made similar drawings for my Dad suffering with Alzheimer’s. It brought him great joy. this is a pretty cool idea! We made paper dolls for our Princesses who live far away. The Mom Person took pictures of everybody and printed them on heavy cardstock. Even me! Those girls played with them a lot.